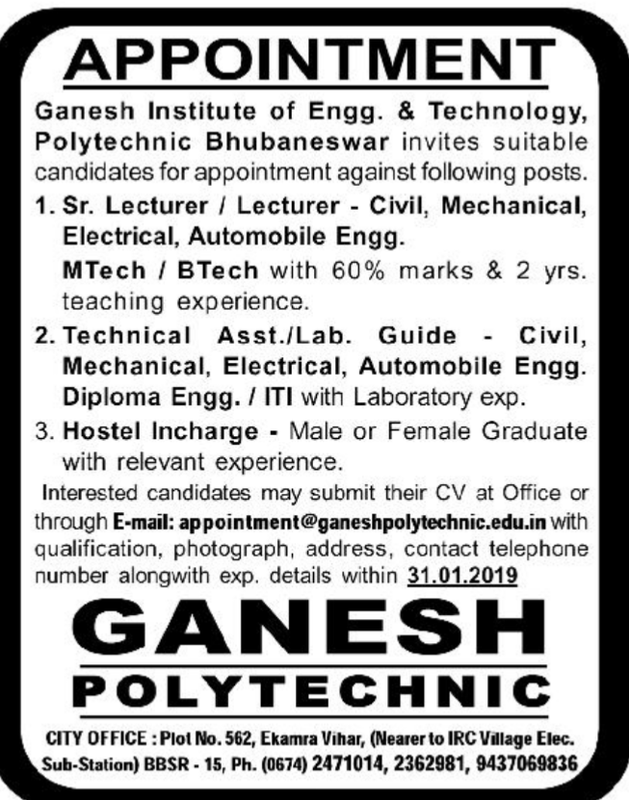 Ganesh Institute of Engineering & Technology,Polytechnic,Bhubaneswar,Odisha has advertised for the recruitment of Teaching Faculty- Sr.Lecrurer,Lecturer,Technical Assist jobs vacancies. Interested and eligible job aspirants are requested to apply with in 31.1.2019. Check out further more details below. Name of the College: Ganesh Institute of Engineering and Technology, Polytechnic, Bhubaneswar,Odisha. About College: The 21st century has witnessed knowledge explosion with inquisitive young brains aspiring for excellence in all diciplines, where only sky is the limit. This is the dream of Er. B.B Tripathy the Chairman of GIET Group of Institutions was established his credential as an educationist and philanthropist, founded the Alakananda Philanthropic Trust with the sole aim of serving society in diverse fields ranging from education to health care. 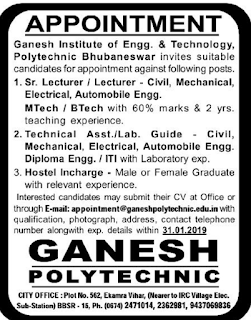 In order to satiate the inherient quality of the students technically and methodologically, Ganesh Institute of Engineering & Technology Polytechnic wing was born in the year 2008. M.Tech/B.Tech with 60% marks& 2 yrs of experience.